EDIT 8/29 8:15 AM Edited to clarify the position of the dynamo in the second photograph. (quick edit–I forgot to properly title this Shocking Truth installment when I posted it. That’s the only change). To the extent that this influences the review, you should be aware that I paid for each of the other units considered here, and so—from a social-psychological perspective—I think that the influences cancel each other out. While I might favor Velogical because of their niceness in giving me a unit to evaluate, I might also favor one or more of the units in which I had invested (“sunk costs”). You should decide for yourself the validity of my review here, but you should be aware that there is difference in the source of the units, and that it may have affected my review, one way or the other. So…tell me about the Velogical? Velogical makes three units: a SPORT model, “for minimal ride resistance and maximum speed.” A TREKKING model “low ride resistance and reserves of power when riding more slowly, for double headlight set-ups or city riding speeds.” Finally, a SPECIAL model for “Maximum power supply even at low speeds, for special applications, for example special chargers for on-board electronics or double headlight set-ups.” These differ externally primarily in terms of the color of the top cap of the dynamo—red, silver, or blue, respectively. I elected to try the TREKKING (hereafter, Trekking) unit because it seemed like a reasonable compromise, and because I’m slowing down in my old age J. And I chose a left-side, rear mount version—for much the same reason that I had done with the Dymotec 6: I wanted to keep the dynamo out of the way (fortunately, as discussed below, I did not run into the same mounting issue). Velogical shipped the unit quickly, and so I came home one day to find a small box waiting for me. Initially, it felt empty. I opened it up to find the dynamo, already attached to its mount, a selection of required small hardware, multiple O-rings, and a thermistor (a small Halogen bulb) to be used in series with the dynamo and the light system (See the Wiki entry here). The eDelux is a pretty small headlight, in my experience. Now look at the Velogical: remember that it’s only the upper half that’s actually a power generator; the disk-shaped section that the wires pass through (below the knots) is the interface to the mount. You can see the silver top cap and the barrel. Between these is the O-ring that actually makes contact with the rim. I really want to like the Velogical unit. But while it is tiny and elegant, there are some issues, particularly at low speeds. With the dynohub (and to a lesser extent with the other dynamos) rolling my bike from its resting place at my workbench to the basement hatch produced flashes of light from both front and rear lights. With the Velogical unit, nada, save for—after a little while—a dim glow from my Pixeo taillight. To my mind, this is indicative of suboptimal performance at very low speeds. Granted, most people are not going to ride at those speeds. Of course, once you’re moving at any decent speed, lighting performance is satisfactory. EDIT 8/29 8:15 AM: Velogical asked me to clarify this photo a little. Note the write handle at the right of the mount is in the middle position. In this position, the dynamo is disengaged from the rim. Moving the wire handle out at the bottom (so that it rests against the outer pin at the lower right of the mount) tensions it against the rim; moving it in the other direction (past the inner pin at the right of the mount) detensions it completely, so that rims with overhanging tires can be easily removed, or the O-ring on the top of the dynamo replaced. The dynamo is shown in its “stowed” position, with the wire handle between the two pins–this is where you’d normally have it during daylight hours. As you can see from this photo, the mount is a simple block of aluminum, held by a U-bracket. You can see the wire spring on the right end, resting in the middle position. The mount has multiple holes, to allow adjustments in positioning, and comes with two U-bolts, so that you can handle both thick and thin stays. Different mounts are available for different bike types and locations. Because I use caliper brakes and have no cantilever studs or dynamo mount on my frame, I chose and was sent a left-rear mount. Hint: You will need a 6mm nut driver to install this mount. Different tools may be appropriate for different mounts. Once you have it set up where you want it, you tighten the 6mm nuts on the ends of the U-bolt to hold everything in place, then loosen the grub screw on the bottom of the dynamo body to adjust position and tension. Unlike the Dymotec and most other bottles, almost the entire outer surface of the dynamo (the shiny cylinder) rotates. It turns with an ease that suggests good bearings. One electrical consideration–unlike the Shimano and Sanyo units, the Velogical is not grounded through its body and mount, so you must run connections from BOTH wires to your lighting system. OK. How does the Velogical rim dynamo, Trekking model, stack up? As far as I know, there’s only one source from which to obtain the Velogical units if you live in the United States, and that’s Velogical Engineering itself (http://velogical-engineering.com). I am told that Velogical is building relationships with US sources, but I was unable to find any through a search before I contacted Velogical. Unfortunately, the Velogical dynamo does not come cheap. The unit price, including one mounting bracket and Value Added Tax, but excluding shipping, comes to 150 Euros, which today is about $200. Additional mounting brackets are priced at 30 Euros, VAT included. In my experience with purchasing from Europe, VAT is generally rescinded from orders sent to the United States, but it isn’t clear to me just what proportion of the 150 Euros is VAT. (VAT is a little complicated if you’re not used to it.) I believe that VAT on the Velogical would be about 19%, so the unit price is around $160 on the back of an envelope. That’s significantly more than a hub dynamo, but remember that you can use your existing rims and do not have to have a new wheel built. Installation, described above, is a little less complicated than with a conventional bottle dynamo, though not as simple as a bottom bracket unit. You place a sticky foam pad on the mount, which goes on the inside of the chainstay. You then place one of the included U-bolts around the stay and through some appropriate holes in the mount. The U-bolts (which come in two lengths to account for differently sized stays) are covered with plastic, probably heat-shrink tubing, to prevent damage to your bike’s finish. Once you have the U-bolt through the mount, you place a small washer and nut on each of its legs, align the dynamo so that it runs straight on the rim (alignment with this unit is just as important as it is with the conventional bottle), and tighten the two nuts against the mount. You will want to have a 6mm nut driver for this operation, because you are going to need to work through the spokes of the rear wheel to adjust and tighten the mount. That’s probably not a scarce tool in Europe, but Velogical might consider including a small nutdriver for their US sales. If you have a good ratchet set, it probably has a 6mm socket (yay! Craftsman) and you can use that. I also kind of wish that Velogical had supplied nylock nuts. These have become my go-to fastener, and while you can surely do without them, they provide a little extra security. Velogical does supply a tiny Allen wrench to help with fine adjustments of grub screws. I should note that my particular installation is probably a lot more complicated than some; if you have canti-type mounts, the Velogical unit can be purchased with a simplified mount that attaches to a stud. That makes front-mounting much more practical (and that would have other advantages—see below). Finally, I should also note that one of the advantages of size is that, even with its position near the rear rim, the Velogical unit fits entirely within the triangle formed by the seat stays and the axle (only the very outermost edge of the U-bolt is outside that triangle, and only by a tiny margin). This means that I did not encounter the problem I ran into with the Dymotec of accidentally “kicking” the dynamo with every pedal stroke. Small size has its advantages. The Velogical unit does not ground to its mount (and hence does not ground to the frame) unless you choose to make that connection yourself, so you will need to run a two-wire connection to your lighting system. Interestingly, the Velogical dynamo eschews the kind of tiny lugs we’re used to seeing on European lighting equipment—instead, the dynamo comes with two long pigtail wires that extend from the bottom of the dynamo. These are securely tied off in the lower (mounting) section, so they can’t be yanked from the dynamo by accident. Velogical favors connection to the dynamo through heat-shrink protected twisted-wire connections. That is, you take one of the dynamo’s two wires, strip some of the insulation, take a wire from your headlight, strip of the insulation, place a bit of heat-shrink tubing (Velogical supplies this with the kit) over one of the wires, then twist (“braid”) the two wires together securely. Slide the heat-shrink tubing over the connection, and heat it with a soldering iron, heat gun, or hair drier. The heat-shrink tubing conforms to the twisted shape of the connection, not only insulating it but making it more mechanically secure. Note that this is easier to do with simple wire connections than with coaxial wire—if your light (like the eDelux) uses coaxial wire, you may find this a little frustrating at first, but it’s worth the effort. The resulting connection is electrically and mechanically solid. One more thing worth mentioning here. To greatly simplify—as voltage rises for a given resistance, current also rises. This can lead to a dramatic increase in the power going into a given load (what was, once upon a time, before the advent of Zener diodes, responsible for headlight bulbs “blowing” on descents). It can also harm the generator. To protect against this problem at high speeds, Velogical supplies a thermistor—in the form of a 15w halogen bulb. The bulb has very low resistance (c. 1 Ω) when cold, but that resistance increases as the bulb heats. This helps to reduce the power curve at very high speeds, protecting the dynamo and the electrical system. The way it is used, it is unlikely that the bulb will ever give off any significant amount of light. It is the user’s responsibility to wire the thermistor—which is supplied with long wire leads—in series between the dynamo and the electrical system. The trick here is that Velogical does not give you a place to put the thermistor. Since it can sit anywhere between the dynamo and the rest of your circuit, it might make sense to place it on the headlight mount. But it seems to me that Velogical would have done better to supply a clip for the thermistor as part of the dynamo mount. Perhaps a bulb that fits into a socket could be used, and a socket built into the mount. I found the Velogical rim dynamo to be satisfactory as a power source, but not overwhelming. In fact, Velogical was in the process of getting StVZO certification at the time I received my dynamo, and it’s worth noting that the approval they did receive—while I was in the process of evaluating the dynamo—was for a device that generated not 3W, but 1.5W. This classification is possible because the “new generation” of lights, which are all LED-based, need less power to generate adequate light (Note also that Shimano produces less-expensive hub dynamos that also fall into this lower power range). But just because the Velogical is certified at 1.5W does not mean that it can only generate that level of power: as we shall see below, it is capable of powering lights at the same time it can charge a USB device. But it does imply that the Velogical is not likely to generate the same surplus of power that a device certified at 3W does. In practice, I noticed this in the way my lighting system, which was designed for a 3W or greater generator, responded. Generally, I found the eDeluxe and Pixeo combination to be a little less bright when I was using the Velogical than when I ran them with other dynamos when running at low speeds (10 MPH and under). There was also a decrease in the time that the headlight took to switch to its lower-brightness standlight mode, and the standlight circuits did not seem to continue to keep the head- and taillights going for as long after a stop. All of these nice “extras” depend on the generator putting out extra energy that can be stored, e.g., in a capacitor, to keep things going when the bike stops. Slipping in wet weather is a bugaboo for all dynamos outside of the hub units. But like the Dymotec and bottom bracket units I checked, the Velogical did not appear to slip. In fact, I had the opportunity to try it in a fairly drenching rain, and it kept the lights going—though as noted above, perhaps not as brightly at the lower “rain” speeds as the other units—even while I was getting thoroughly soaked. This is pretty impressive given the relatively weak spring force holding the unit in place. Because of my experience at low speeds, and because I consequently tended to think of the Velogical unit as a “weak” generator, I was not expecting the rim dynamo to be up to the task of charging an additional device. Happily, I was wrong. Although it took a moment while I rolled out of the driveway and built speed, I was very pleasantly surprised to hear my phone chime to let me know that it was charging. Because I do not have adequate tools or time, I cannot tell you if the phone was getting a significantly lower charge than it would from other devices (indeed, I cannot rank the devices in this respect) but there should be at least enough power to keep a small USB device running, if not charging. 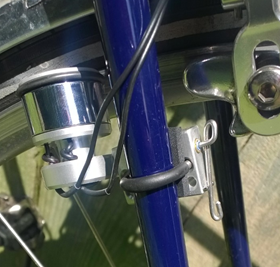 With the rear mount, you really need to dismount to switch the Velogical dynamo into working position. It’s likely that such would not be the case if it was mounted on a cantilever post, but I found the bale impossible to work from my riding position. Position helps, but the Velogical is pretty quiet from the get-go. The sound that it does make is lower-pitched than that of either the Dymotec 6 or the Sanyo bottom bracket units, more of a hum than a whine. It was by no means unpleasant, which was a nice change from the (front-mounted) Dymotec’s siren song. There is a slight but detectable vibration from the unit when you’re walking the bike with it in its engaged position. Once you’re actually riding, however, the vibration disappears, and all that’s left is the hum noted above, and that vanishes into the wind at around 12 MPH. Does the dynamo cause resistance, and can you feel it? The second is more complicated. Once I had the Velogical mounted, my sense of its resistance was surprisingly low, so I decided to do a quick spin-down test. First, I connected my lights to the hub dynamo and spun the front wheel, hard. With the lights connected, the front wheel stopped spinning fairly rapidly. Next, I connected the lights to the Velogical, engaged it, and gave the rear wheel a similar spin. It took significantly longer for the rear wheel to come to rest, with the rim dynamo engaged, than it had the dynohubbed front wheel. Consequently, while you can feel the resistance of the Velogical, it gives the impression of putting a very small load on the wheel compared to the other units I tried. I should also mention here that since the Velogical runs on the rim rather than the tire, like the bottom bracket dynamo, it frees you from concerns about sidewall wear. And since the physical load is quite low, any concern about rim wear should also be relieved. What explains the surprisingly low physical resistance of the Velogical? Several factors probably contribute, and the first is simply that it is not built to put out as much power as older units. My guess—and it is only that—is that for a given load, the Velogical will achieve 3W of power at a higher speed than the other units looked at here. Moreover, I suspect that all three of the other dynamos I tried will exceed the Velogical’s output at any reasonable given speed. But, as I said, that’s only part of the story. The Velogical dynamo, being as small as it is, certainly must have a different arrangement of magnets and coils. It is likely that, as relatively low-priced, mass-produced units, development on sidewall dynamos remained relatively (pardon the pun) static for a long time. Velogical’s 21st-century foray into dynamos takes place against a backdrop of computer simulation and computer-aided design and the development of more powerful magnets. It’s simply a better mousetrap. Finally, the same factors—price and mass production—that limited updated design of the sidewall dynamo also affect its construction. The Velogical costs four times as much as the Dymotec, and it shows. As noted above, the unit turns easily, in a way that suggests good bearings and precise construction. While the dynamo itself is sealed, Velogical makes available a range of mounts, and the dynamo comes with several O-rings, allowing for replacement of the roller surface. Simply roll the old O-ring off the top of the unit, and roll a new one on. The literature that comes with the dynamo describes the supplied O-rings as being made of a special compound, but I suspect that a visit to your local hardware would supply at least a temporary replacement should you run out of replacements. Of greater concern in the US is the possibility of losing a few fasteners from the mount, since tiny metric U-bolts and nuts are scarce, even around bike shops. However, if you do things right, this should not be an issue (and is almost certainly not an issue for the cantilever stud mount). The Velogical unit is a joy to behold and, for a very perceptive and well-equipped bike thief, a potentially valuable prize. However, it is also small. It’s the sort of thing a bike enthusiast might get excited about (indeed, at least one bicycle has been built around the Velogical unit!) but not something likely to make for a quick grab. It probably won’t be noticed. When I first started writing this review, my early drafts all started out “I really want to like the Velogical unit.” I still do. I think it’s an excellent bit of engineering and it works very well. That being said, I am, as an American, all about power. The Velogical is sufficient as a power source, but it does not pile on the power the way older units, or hub dynamos, do. As a daily commuter, I find that the lower output of the Velogical makes me a little nervous. Not a lot. My nervousness comes about likely because I’ve used a hub dynamo for years and that has formed my expectations. The lower output of the Velogical may come about in large part because all of the earlier units were designed to work with incandescent lights. The Velogical rim dynamo is designed specifically for a 21st-century technology: LEDs. Consequently, it does not need to pump out the kind of juice that you need to keep a filament hot. Instead, it takes advantage of the efficiency of LEDs to permit a smaller, lighter, smoother power source. This comes at a cost, however: lights and generators are engaged in a kind of dance: the generators we have now—other than the Velogical—are designed for less efficient lights; the LED lights that have emerged in recent years reflect (sorry, pun) the power output of those generators. They take advantage of the extra juice. If the dance continues, we may see more dynamos shrink (I referred to the lower-power Shimano hub units above) as LED technology improves. All of this comes together in the Velogical’s comparatively lack-luster performance at very low speeds. If I had to pull directly into low-speed traffic when leaving my job, I would be concerned for at least the first few seconds (10-15) that my lights were not working at optimum brightness, and that the standlight circuits were not adequately charged. That concern would be easily alleviated by a little stretch of parking lot or other pavement that allowed me to bring the bike up to speed and the lights up to charge. Not a big concern, but it’s there. My next blog will draw this whole thing to a close, with a comparison of the four dynamos and some suggestions as to what kind(s) of users will benefit from each. It may be a few days in coming, but it is coming. This entry was posted in Uncategorized and tagged bicycle, bike, dynamo, dynohub, LED, Light, Velogical. Bookmark the permalink. Pretty intriguing. The business about using a bulb as a thermistor, and using that to regulate the output does surprise me. For the price of this dynamo, I would have thought that electronic regulation would have been used. How big or bulky is that bulb? Is it replaceable? Properly selected, it ought to last much longer than the old dynamo bulbs that were run pretty hot, but it’s still going to be less reliable than the LED headlight that it will be used with. That was a concern of mine as well. Velogical Engineering assures me that in its use as a thermistor, the bulb doesn’t experience much heat or other stress below 40 KPH (25 MPH), and that limited runs of 60-65 KPH (37-40 MPH) will not raise the bulb to the point where it would, e.g, cause problems with heat shrink insulation. (This is a reasonable point, as the bulb is rated to handle 15W). In any event, I have encountered few riders who run at those sorts of speeds in darkness or rain! While I like the idea of a mechanical regulator, thermistors are not uncommon, and if the part is suitable and replaces a more complex circuit, that’s fine with me. The bulb is not large–I will try to add a photo to the site later this evening (assuming I remember) and seems sturdy (though my own inclination is to distrust anything made of glass–probably due to my own lack of coordination!). My main peeve is the lack of a good place to put the bulb. I built it into one of the boxes of the “bus” (see: https://lawschoolissoover.wordpress.com/2014/07/24/the-shocking-truth-part-2/) but it seems a little awkward to me. It also constitutes a single point of failure if it does burn out, however unlikely that may be. Since the thermistor is wired in series with the rest of the light system, that could leave the rider in the dark. My bus allows an easy work-around in the event of thermistor failure (just choose a different socket) but that’s not practical for all riders, and it’s more complex than I like. I suspected as much, but you can’t blame the Velogical folks for being cautious. They only recommend their dynos for use with LED systems in any event. Remember too, though, that LED lights are not just LEDs; these days, they contain a significant number of other electronic parts–at least (in most cases) a rectified, probably a bridge. Such circuitry can be damaged by overvoltage, but I don’t entirely understand that aspect of the circuit. Anyway, at any reasonable speed, you’re probably just fine without the thermistor. Kerry, I took a look at your website and the claims and products are interesting, to say the least. I’d love to correspond with you offline. Please email me at (robot obfuscation follows): marchant (no space or dot between the two ) shapiro, followed by the usual address connector, then “the mail that is g”, dot com. the subjects touched on by Kerry and Steve above have been discussed many times and at great length at both the old BikeCurrent list and at Candlepowerforums bike lighting list – http://www.candlepowerforums.com/vb/forumdisplay.php?86-Bicycle. Also at the mtbr bike lighting list. For other excellent surveys of hub dynamos maybe checkout the free pdf reports – at the CTC web site (http://www.ctc.org.uk/file/public/feature-hub-dynamos.pdf) and the Bike Quarterly article (http://www.bikequarterly.com//images/BQGeneratorResistance.pdf). You may want to provide these links at your own excellent series of articles. Thanks so much for that very helpful review. I wondered: What USB charging device did you use with the Velogical?